The e-book was first published in 2017. There is little information on its author, but he calls himself “an expert, a consultant in the field of futures trading.” As the book’s postscript tells us, it was first written in Russian and then translated into English. This can be seen in some poorly translated sentences and occasional bad choice of words, but it does not create significant obstacles to understanding of the described method. According to the author, a locked-in range is a price range in time (usually, a rectangular chart formation) where large volume of open positions is accumulated by market makers on a Forex futures exchange. The range has to be broken to execute the accumulated position’s stop-loss and break-even orders. The author’s method of analysis for locked-in ranges describes the actual conditions and scenarios to exploit the market behavior after such breakout occurs. It is the futures market that moves the currency rates, not the spot. In reality, exchange-traded futures amount to just a minuscule share of the total $5.1 trillion average daily volume in Forex. As can be seen in the BIS Triennial Report 2016, exchange-traded derivatives (also include options) have the average daily volume of $115 billion. Also, currency futures traded on CME do not deviate significantly from the spot rates (adjusted for interest rate difference) because of the arbitrage. Market makers in CME FX futures act as a single purpose-driven entity. In fact, for its currency instruments, the CME authorizes market makers to operate only in FX Blocks, which are privately negotiated large-volume deals performed by institutional traders. FX Blocks market makers do not make markets for “normal” hedgers/speculators futures trading. Market makers drive significant price changes. In reality, market makers do not rely on price manipulation to stay in business. Most of them utilize stochastic control theory (for example, Hamilton-Jacobi-Bellman framework) to minimize inventory risks and maximize profits. The topic is covered extensively in modern financial literature. The author builds the entire LRA technique on these incorrect assumptions. Nevertheless, he describes a trading system, which is not unreasonable, — similar to rectangle breakouts and fading false breakouts. It is a viable strategy but it has little to do with the whole market maker vs. traders action. Unfortunately, the author tries to market his method on “us vs. them” mentality, self-victimization (claiming hidden motives when forum admins ban him for advertising LRA), and creating fake users to advertise it on forums. That is why I do not recommend wasting time to read this e-book. You can easily find better free Forex trading e-books out there. 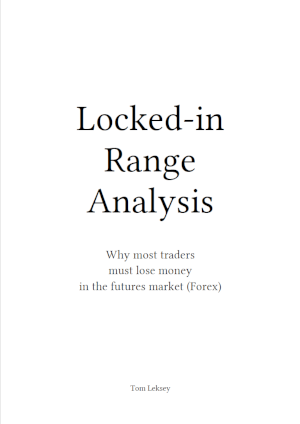 If you have any questions, comments, or opinions regarding Locked-in Range Analysis by Tom Leksey, please feel free to post them using the commentary form below. If the Locked-in Range Analysis method is wrong, why it just works? The review does not call the method wrong – it says that the method is based on false assumptions. Why do you believe that LRA as a trading method works? Is there a rigorous test of its performance built on objective entry and exit rules? Does it beat a similar support and resistance method?
. After all, even random entries and exits could produce good results (sometimes).